As Better Call Saul enters its fourth season next month, we know the AMC series will bring us closer and closer to the Breaking Bad timeline. When the Bob Odenkirk-led prequel finished off last season it was 2003, but Breaking Bad doesn’t begin until 2008. So just how close will Saul bring us to Walter White’s world? Based on some new comments from Vince Gilligan and co-creator Peter Gould, and a set photo, I’ve got one theory. We have a subplot that very squarely gets into Breaking Bad territory and brings us into the world — or at least points us on a path toward the world of Walter White and the territory of Walter White. I can’t wait for folks to see that. We’re still a few years out from Walter White, but you’ll see some things that will definitely ring a bell and also show some different aspects to things that we saw in Breaking Bad. See his purple shirt? See the little bandaid over his nose? 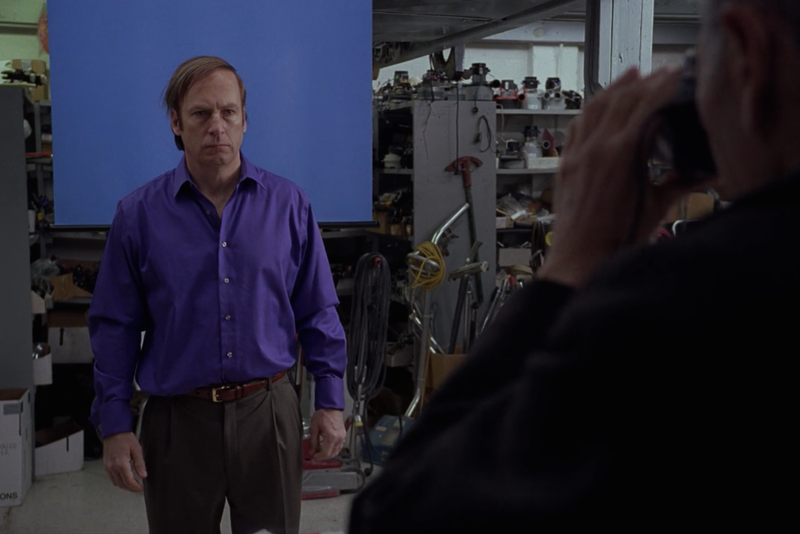 Now take a look at this screen shot of Odenkirk in Breaking Bad‘s penultimate episode “Granite State.” Look familiar? That’s the episode where we meet Ed the Disappearer, when Saul gets his ID photo taken for his new Nebraska identity, and the only episode Robert Forster’s Ed appears in. It’s also the very last Breaking Bad episode Odenkirk is in. So it would make sense for Saul to jump ahead, somehow, to that moment. But how exactly? My theory is the subplot Gilligan mentions involves Ed. The prequel series will likely show us how Jimmy met Ed in the first place, years ago before the Breaking Bad identity swap, probably with another case where he sends someone else on the run to the vacuum repair shop. And interestingly enough, while there’s been no word of Forster’s casting in Season 4 of late, the actor did confirm to Vulture back in 2014 that he was officially set to reprise his role on the spinoff. The question remains how exactly Better Call Saul will organically jump to that scene with Saul and Ed, which takes place in roughly 2010. Will it be a part of the Season 4 black-and-white opening? It’s curious that the show won’t just reuse the same footage from Breaking Bad and instead put Odenkirk in the same costume and makeup. It’s also worth noting that Walt is sitting in the basement of Ed’s shop during the above scene. So while Bryan Cranston has yet to confirm if or when he’ll show up on the show, if we do see a flash-forward a tiny cameo could happen. We also know the new season will finally introduce the mysterious “Lalo” character, first mentioned during Saul’s debut episode on Breaking Bad, and bring back the Salamanca cousins. Hopefully we’ll find out more during the series’ Comic-Con panel tomorrow. Better Call Saul returns for its fourth season on August 6.